Official Website of Fiji Rugby Union » Quick Rip program enhance simple rugby strategy and promotes healthy lifestyle. Quick Rip program enhance simple rugby strategy and promotes healthy lifestyle. Home > Newsroom > Quick Rip program enhance simple rugby strategy and promotes healthy lifestyle. Quick Rip is a fast, non-contact, flag version of rugby which has been developed and implemented in New Zealand and introduced to Fiji mid 2018 with the intention of introducing a healthy lifestyle and balance training schedule to its participants, especially young adults. 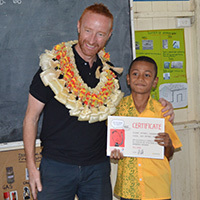 The program is funded by the New Zealand’s NZ Aid Program through the Pacific Sporting Partnership – Sport for Health [Rugby] Program and New Zealand’s Ministry of Foreign Affairs and Trade. 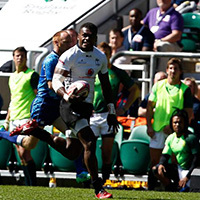 It was introduced into Fiji following consultation with the Fiji Rugby Union and the Fiji National Sports Commission. In Fiji there are various sporting competitions in schools all with the same aim of inheriting children with a proper and active lifestyle which keeps them healthy. But unfortunately not everyone benefits from these competitions as only the ones with any sort of sporting potentials get to hop on board and join the team, and thus there are many teenagers that would like to be involved in the game that simply don’t have the opportunity to do so. And of course majority of these group are the ones in need of regular exercise and the healthy lifestyle message. This is where the Quick Rip program comes in with the objective of increasing participation in sports outside school where anyone can take part and also increase awareness amongst parents and children of the importance of physical exercise and nutrition for improving healthy lifestyles. The target age group is teenagers between the age of 14yrs and 19yrs and the program is expected to produce a result in this age group leaving them more physically active, with the intended long-term outcome (over 20 years) of reducing the prevalence of obesity and overweight issues in children. 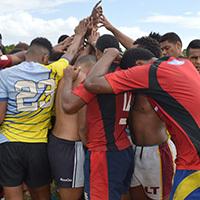 Fiji Rugby Union’s QUICKRIP Regional Coordinator, Tevita Kanalagi emphasized that part of the program’s health component is consulting participants on the level of fluids to take per day providing them with water bottles and also providing fruits for them in every session they take part in any quickrip competition. Kanalagi also explained that not only the program keeps participants active and healthy but in a way also enhance the participants understanding of simple rugby technique and strategy. “Going through this program attacking players will learn on eyeing out gaps in the defense and run for it, so in a way it urges participants to go for gaps as defenders wont tackle you but have the advantage of just pulling your tag, so you have to create momentum, look for gap, evade your opponent in every possible way you can,” said Kanalagi. This program might be a stepping stone for future rugby stars as children from as young as 14 years get to familiarize themselves with rugby skills and technique from an early age, even though some might not be part of a rugby team but yet they’re learning similar strategies which will enhance their rugby insights on the field which they can benefit a lot from later on in their rugby life. Also part of the program is to provide coaches from every district with training methods and skills which they can inherit to teach on their players, adding to that are rule books and training programs where participants can follow and benefit a lot from. Kanalagi explained that the Quick Rip Awareness program has covered Nadi, Lautoka, Ba, Tavua, Tailevu North, RFMF HQ’s and all the way up North at Labasa and Savusavu. In Quarter1 of 2019 this awareness program is to be extended to other uncovered Regions in Viti Levu, Vanua Levu, Taveuni and the maritime zones. The program development and implementation will take a participatory approach. The FRU encourages children (girls and boys alike), parents, teachers and sports administrators to participate in the program development and ensure that it meets children’s human rights and interests. Barriers to participation, especially gender based barriers, will be reduced both by consulting girls directly, as well as consultation with other stakeholders and duty bearers (parents, churches, government agencies).